The GST Helical gearbox mounting position determines the oil fill level and the appropriate vent location. It is very important that the correct mounting position is specified when ordering, if a gearbox is fitted in a position other than the one specified on the name plate then it’s very likely that oil starvation will occur on some gears and bearing with catastrophic failure or the unit. 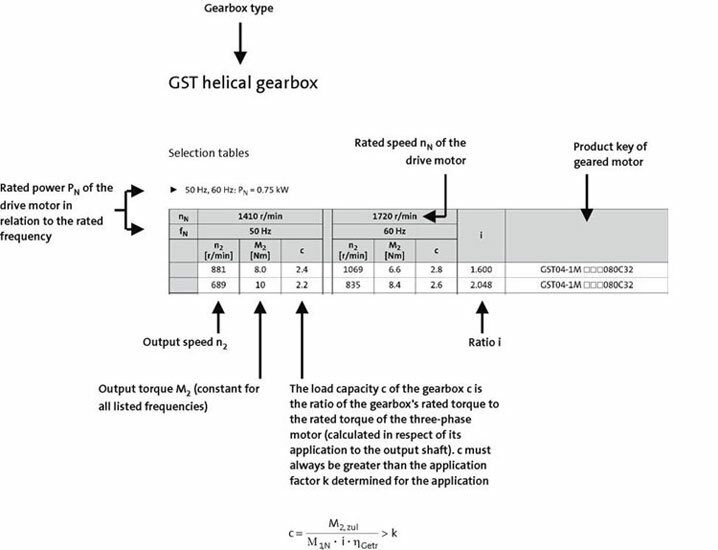 Please see chart below and check the GST helical gearbox or geared motor before installation as incorrect mounting position would void warranty. 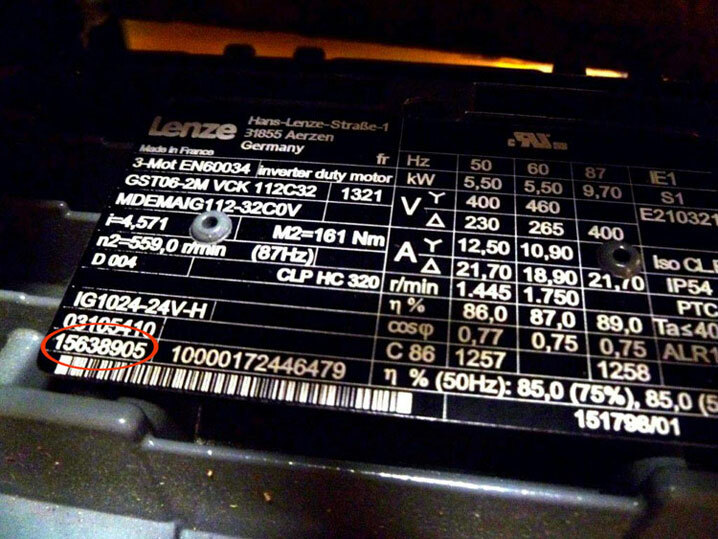 Lenze GST Helical Geared Motor Identification. 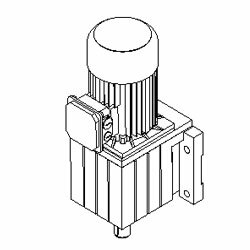 It is most important when purchasing a replacement Lenze GST Geared Motor that the unit is identified correctly, the Lenze GST modular makeup means an infinite number of options available and many of the options are not always visible. 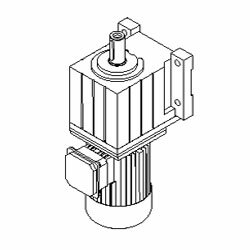 Fortunately Lenze assign a unique number to each geared motor that identifies the unit exactly, because the number is unique to your geared motor it ensures an accurate quote for a replacement and peace of mind that the replacement unit will fit and perform exactly as the original. The name plate below shows the position of the identification number. The above style of nameplate has been used for approximately 8 years but if the plate is silver as below the unit will have 2 nameplates one for the motor and one for the gearhead again using an 8 digit unique identification number and starting 15****** or 13****** we need the details off both nameplates for correct identification. 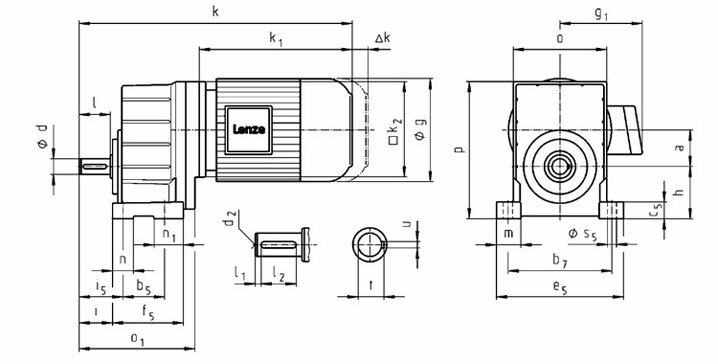 Lenze GST helical gearbox and geared motors are ready for operation on delivery and are filled with lubricants specific to both the drive and the design. The mounting position and design specified in the order are key factors in choosing the volume of lubricant. 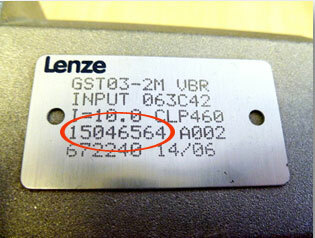 The lubricants listed in the lubricant table are approved for use in Lenze drives. This documentation is directed at qualified skilled personnel according to IEC 60364. Qualified skilled personnel are persons who have the required qualifications to carry out all activities involved in installing, mounting, commissioning, and operating the product. 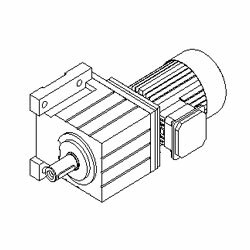 The Lenze GST Helical Gearbox and Geared Motors are designed to be operated in the following conditions to obtain its full operational life, should your application fall outside the stated conditions then operational life could be adversely affected. Please click link below to see exact operational limits or call Transdrive sales desk for guidance. 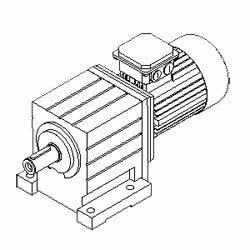 The rated power specified for motors and geared motors applies to operating mode S1 (in accordance with EN 60034). C is the load capacity of the gearbox, this is determined via several variable factors. 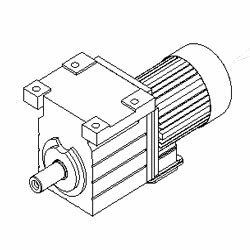 It is important to select the correct load capacity C of the gearbox as this ensures the gearbox is robust enough to give its full service life, incorrect selection could result in premature failure of the gearbox or oversizing with a larger and more expensive gearbox being selected than required. As a rough guide with 8 hours per day running and no more than 10 starts per hour with correct oil selection and ambient temperature, then a selection of C as below would be suitable. For a full and technical explanation of load capacity C please see below or call Transdrive for further advice. 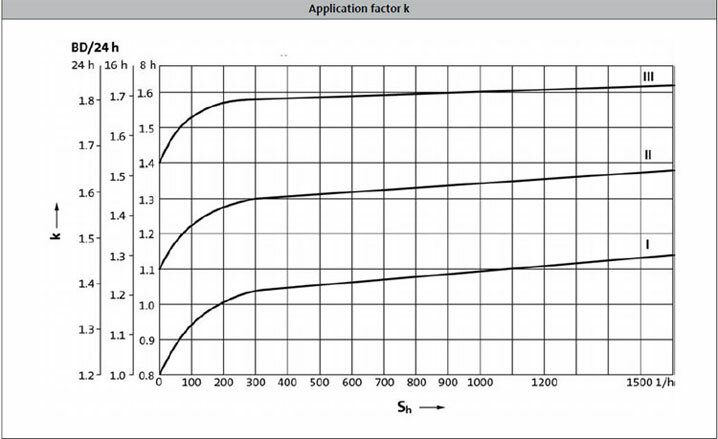 The value of c must always be greater than the application factor k calculated for the application. 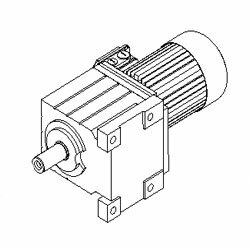 Take into account the influence of temporally variable loads which are actually present during the atnticipated operating time of gearboxes and geared motors.